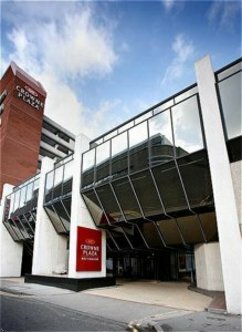 Crowne Plaza Nottingham is one of the most stylish hotels in the Midlands. In the City Centre nearby many Government offices, the University, the Queens Medical Centre and Casinos, the Crowne Plaza has air conditioning in every bedroom plus an indoor swimming pool.Close to Nottingham East Midlands Airport and the vibrant city centre, we have 210 recently refurbished bedrooms including flat screen TV's, mini bars and laptop safes (in most rooms). In addition we have a choice of bar and dining options, a leisure club and our own 600-space car park with direct access into the hotel. As the East Midland's No1 Conference and Meeting venue we offer 17 excellent rooms from a Boardroom for 6 to a conference for 400 including your own dedicated conference partner, use of Workbase and the services of our own in-house technician with the latest audio visual equipment with wireless internet access. From ancient to modern, Nottingham is the home of Robin Hood and Paul Smith, combining history with style as the East Midland's premier shopping City. Our sporting heritage is unparalleled too with Trent Bridge cricket club, 2 football teams, The National Ice Arena, Nottingham Castle and the National Watersports Centre, only a few of the great places to visit in Nottingham including the renowned nightlife. In accordance with English law this hotel is now non-smoking throughout.